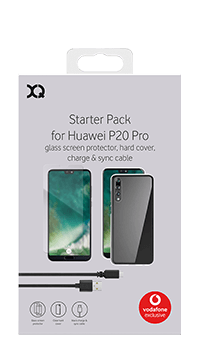 Keep your Huawei P20 Pro fully powered and protected with this essential pack. Includes tempered glass protector and USB charging cable. Keep your P20 Pro fully charged and free from bumps and scratches with the XQISIT Accessory Pack – perfect essentials featuring highly-resistant phone protection and a charging cable. Safeguard the screen of your Huawei P20 Pro with the ultimate protection. Highly resistant to drops, knocks and chips, the tempered glass XQISIT screen protector keeps your phone looking great. Preserve the smart look and smooth lines of your P20 Pro with the clear XQISIT polycarbonate smartphone case. It's easy to attach with just a single click to keep your device scratch and bump free, and also maintains easy access to all of your phone's ports. Sync your data or charge your Huawei P20 Pro quickly and easily with the convenient, one-metre USB to USB-C cable. Plugs straight into your laptop, tablet or any other USB-compatible device.